Natural history: Elysia sp. 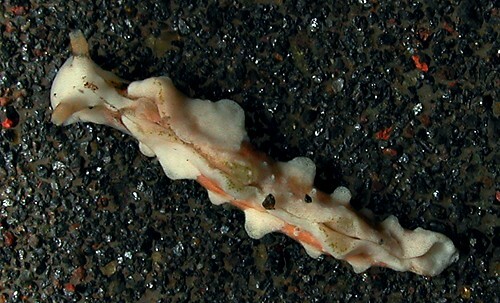 #7 is a moderately common plakobranchid that is found on rocky bottoms in moderately protected to moderately exposed locations at depths of < 1 to 4 m (< 3 to 15 ft). It jerks its parapodia intermittently while crawling. Distribution: Maui and Oahu: possibly known from Madagascar. Taxonomic notes: First recorded in Hawaii from Maluaka, Maui by CP on Nov. 15, 1995. Photo: CP: 7 mm; large tubercles, light: Hekili Point, Maui; June 3, 2003. Note 1: Although speculative, the distribution on Maui suggests that animals with larger tubercles may occur in areas with higher surge. Perhaps, they enlarge during development in response to hydrological stress?